Unionville Milliken Soccer Club - Strikers Kennedy Faulknor, Sarah Stratigakis & Shana Flynn take the National Stage! 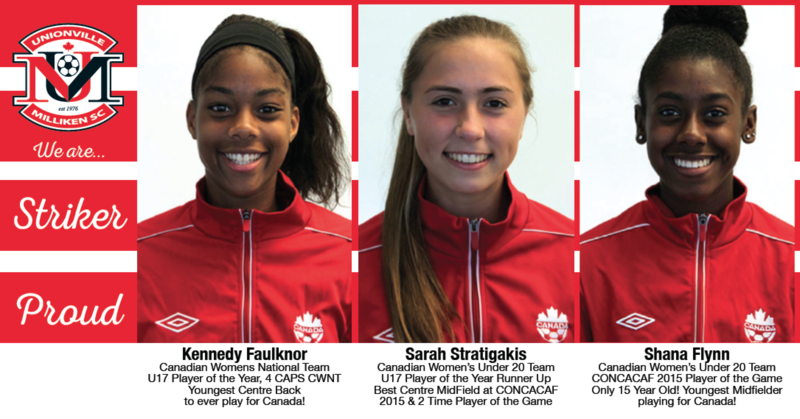 Strikers Kennedy Faulknor, Sarah Stratigakis & Shana Flynn take the National Stage! Unionville Milliken Soccer Club is proud to share the news that three of our Strikers have taken the national stage by storm! Kennedy Faulknor, 16 and member of UMSC for the past 10 years, was recently named U17 Canadian Soccer Player of the Year! This incredible honour was announced while Kennedy was in Brazil playing for the Canadian Women's National Team at the NATAL 2015 Tournament!!! Kennedy recently has attained 4 CAPS with the national team, which is coached by John Herdman and is the youngest centre back to ever have played at the national level! Kennedy recently thanked UMSC coaches Alex Morales (Kennedy's UMSC Coach who also coaches UMSC's 2007 Rep Girls), father & Coach Glenn Faulknor and UMSC's Girls Technical Director Paul Omoghan. Sarah Stratigakis, 16 & member of UMSC, was recently named the U17 Canadian Soccer Player of the Year Runner Up! Sarah was captain of both the Canadian Under-20 & Under-15 National Teams. She was selected to the Best XI at the U15 2014 CONCACAF and as well to the U20 2015 CONCACAF. At the recent Honduras CONCACAF, Sarah had a huge impact and was named Player of the Game two times and BEST Centre Midfielder. With her leadership and talent, the Canadian U20 Team qualified for the FIFA U-20 Women's World Cup being held in Papua New Guinea in 2016! Sarah's coaches at UMSC are Alex Morales and Glenn Fauknor along with UMSC's Technical Director Paul Omoghan. Shana Flynn, 15 & member of UMSC, is the youngest member of the Canadian Women's Under-20 CONCACAF team! Shana was only 13 years old when she made her debut in the Canadian national program with Coach Bev Priestman. Shana won a gold medal at the CONCACAF Girls Under 15 Championship and recently won a silver medal at the CONCACAF Women's Under-20 Tournament in Honduras. Shana had a huge impact at the recent CONCACAF and played over 241 minutes scoring 1 goal and being named Player of the Game! Shana's coaches at UMSC are Alex Morales and Glenn Fauknor along with UMSC's Technical Director Paul Omoghan. UMSC is #STRIKERPROUD of Kennedy, Sarah and Shana and look forward to celebrating their successes in the New Year at a club-wide Hall of Fame ceremony. All three inspire the next generation of soccer players and a nation!